I LOVE, Love, looooove Fashion! I couldn't resist a post on this Fashion Friday with a cool card inspired by a lovely dress (I found the image on Pinterest). All things vintage, elegant and scroll-y (is that a word?) and in fashion?? Yes - Please!! 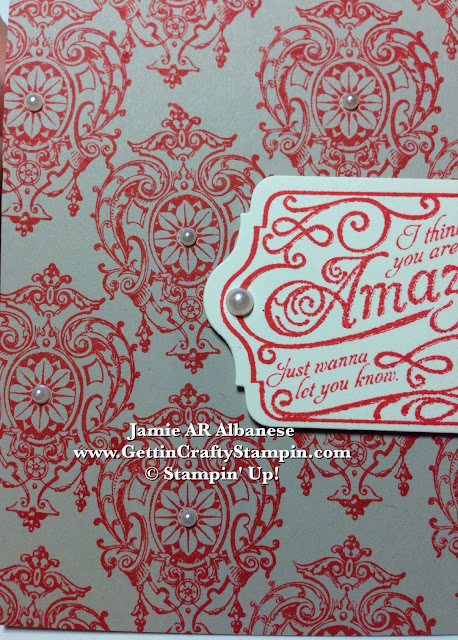 So this fun and easy hand-stamped card came to life and I couldn't resist sharing it with you. I love this pretty, feminine and elegant dress. Sadly, I can't wear this coral color (I'm drawn to it but it doesn't do me any favors, sigh). Taking this love of the color and design and turning it into something I can style... a hand-stamped card is easy and fun! Start with the Sahara Sand card stock (scored at 5-1/2" and cut at 4-1/4"). Using this scrolled medallion from the Lovely Romance stamp set and making a background is easy (especialy with the clear mounted stamps and Stamp-A-Ma-jig #101049). Accent the medallions with our adhesive backed Pearl Jewels (there are three sizes and 150 pearls on each sheet - here I used the medium pearls on the medallions). Stamp the image with Calypso Coral ink on Very Vanilla card stock. Use the Chalk Talk framelits on the Magnetic Platform and Big Shot Die-Cutting Machine to easily frame and cut out this sentiment. Pearls would be an awesome accent to this dress and the hand-stamped card inspired by the dress! Add the large adhesive-backed Pearl Jewels to this sentiment. 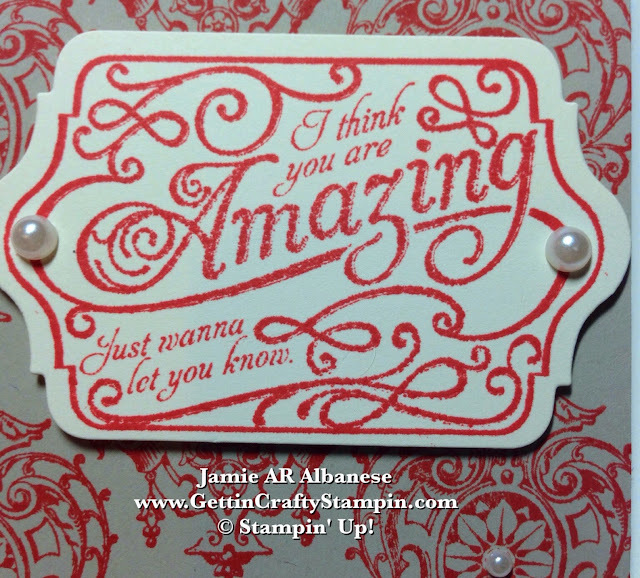 Raise it above the card with our Stampin' Dimensional Adhesive. When you have an Amazing person in your life - show them that you care! Sometimes it's the only time they will hear how Amazing they are (life is hard folks). With a fun Fashion Friday inspired card you can be feminine, elegant and trendy! No matter what inspires you (nature, fashion, memories and more) show that you care with a hand-stamped card. Brighten someone's mailbox (and day) instead of their in-box.